Diving done, we jumped into the 4×4 and went exploring. Our main purpose to see the WWII sites around the island. 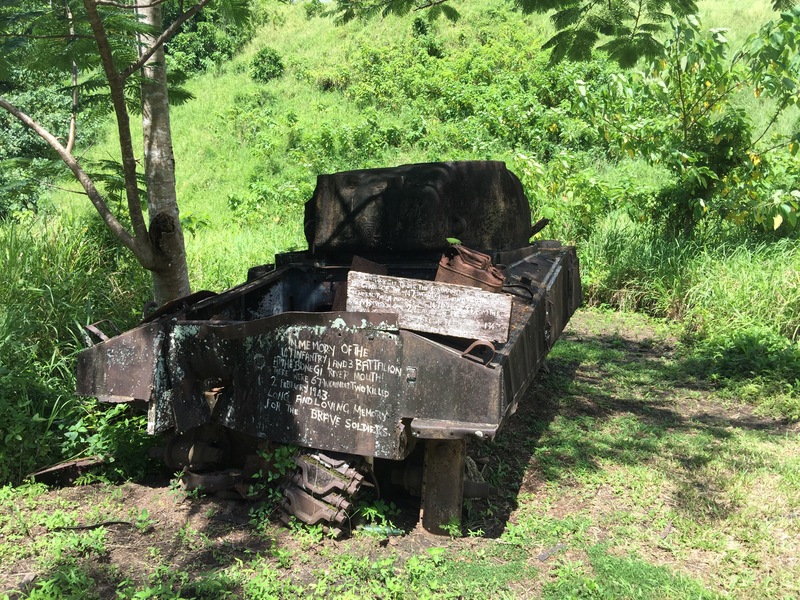 Near where we had dived the map showed a Sherman Tank in the jungle. A small wooden sign and an overgrown grass/mud track weaved its way into the bush. We cranked the car into 4 wheel drive and drove in. We feared the track would be water logged and muddy but it was dry and relatively drivable (not without a 4×4 mind). After 10 minutes we happened across the tank. Rusted and collapsed it sat in the middle of the tall grass. The main gun was gone, but it was easily identifiable as a tank. Parts of the track could be seen as well as bits of the inside. A jerry can also was left on top complete with a tropical bug that looked like a bright green leaf. Tank explored we turned around, got back to the main road and drove west. We headed for the museum. No signs (there are no signs anywhere) were present for the museum nor was it on the main road. After asking some locals and turning around several times we headed down a dirt track, past a few huts and through some very very tall grass. And out of no where appeared the museum. 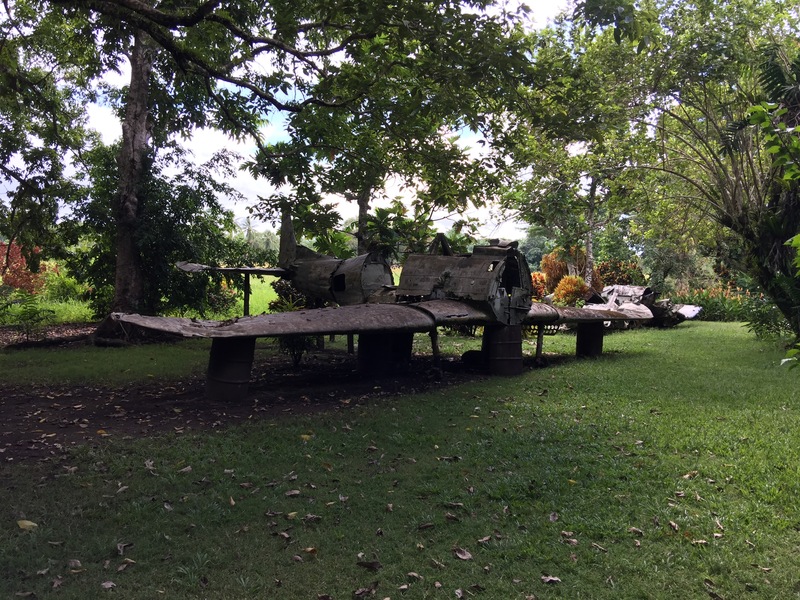 A collection of various guns, cars and planes found across the island in the jungle left over from the war. All in the middle of jungle with no information and several thousand mosquitoes and giant snails (weirdly). We walked around guessing at what things were (much was twisted metal) and batting away the mosquitoes. We spent comparatively little time mainly because there was no information and we were being eaten alive. After the jungle ‘museum’ we headed back to the main road and continued west. We drove and drove past some beautiful beaches and through some small villages until the road became dirt and we were driving through rivers. We stopped at a beach, covered in black volcanic sand, and took pictures before heading back. On the way we stopped some more to take pictures. Mike flew the drone over the sea, where it had a little connection issue due to some birds, so he flew it back. As he flew we realised we had stopped next to a shack which turned out to be an infant classroom. Compete with the teachers handmade posters about the alphabet, local wildlife and numbers. 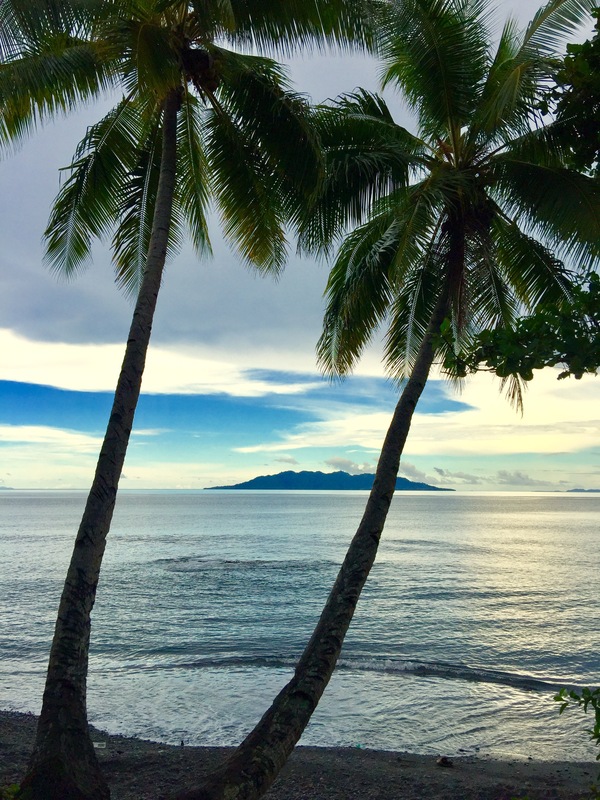 After several hours of driving we headed back into Honiara. We got stuck in traffic so instead of going back to the hotel we found somewhere to eat close by, at another hotel. After a couple of hours the traffic had subsided and we headed home. In the morning we decided to head east across the island. First we stopped at the Japanese war memorial which was located near our hotel. 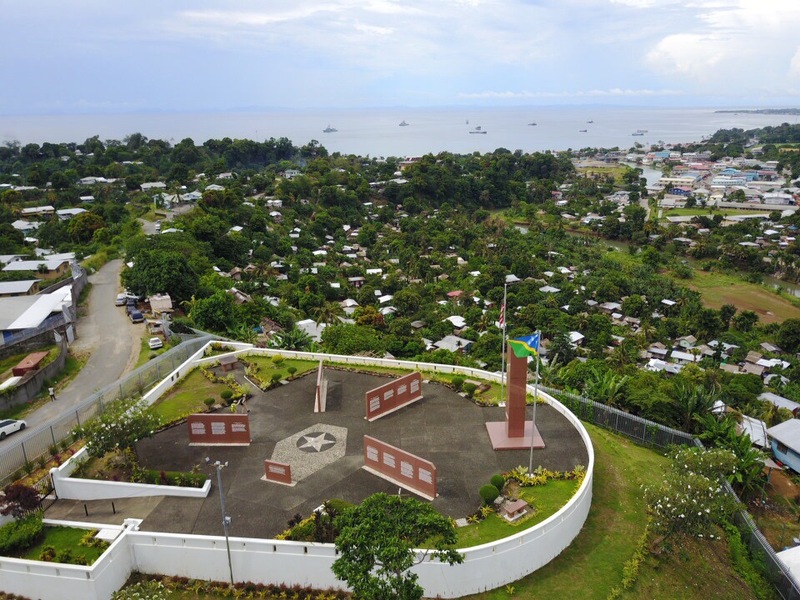 Instead of paying a local an entrance fee Mike flew the drone over the top and across and over the view of Honiara we enjoyed. Then we headed east. Once passed the airport their wasn’t really anything to see. A few villages. We drove for several hours down the road but it was not nearly as scenic as going west. We drove through a palm oil farm which was interesting. The road turned to stone and finally to dirt which became flooded. We turned around and headed back. Mike W took over some driving and I napped in the front seat. Back in town it was now early afternoon so we headed to see the parliament building. Nothing of note or particularly special, just a round grey building. Next we went to the American War Memorial. Beautifully made and it told the story of the conflicts of WWII the island had suffered, witnessed and why the straight between the islands is now called iron bottom sound. From the view on the top of the hill we could also see 3 Taiwanese war ships in port. Sailors were regularly being dropped of at the monument paying their respects and went we got back into the centre we could see just how many sailors there were. As it was Good Friday most places were closed so it took a couple of attempts to find somewhere for dinner. With not much to do we headed back to the hotel and watched a film on the laptop. We checked out late the following day and had something to eat in town for lunch. Town was very busy with the war ships and overnight a cruise ship had also docked. We returned the car (annoying we couldn’t return it at the airport) and got a taxi to the airport. The temperature was stifling and we all melted in the non air conditioned car. Next stop was Vanuatu for a few days and a visit to a volcano! But not before finding Mike W wasn’t booked on the flight, several calls and expense later!